Elikapeka Garcia is a vibrant, loving and carefree 17 year old young lady who has been dealing with stomach pain for a little over a year now. With multiple tests, ultrasounds and blood tests all returning normal it was determined to be constipation and intense menstrual cramps. This past February when blood started to be present in her stool we scheduled a colonoscopy. But due to there only being one specialist on island, it could not be scheduled until April 19, 2018. The Doctor could not perform the colonoscopy because her intestines were inflamed so she recommended that we go to Kapi'olani Hospital for Women and Children on O'ahu for further tests. We flew out that afternoon and she was admitted. Her CT scan the next day revealed a softball size tumor in her abdomen which is applying immense pressure on her intestines. They needed to run more tests to determine what kind of tumor it was. On April 26, 2018 they conducted another biopsy and on May 2nd she was diagnosed with Stage 3 Ovarian Cancer. Chemotherapy and surgery was determined to be the plan to battle this. She was about to graduate High School from Lahainaluna and was determined to walk the line with her classmates. Her Doctor advised since it was low grade they would wait on treatment and allowed her to finish school. She graduated on May 27, 2018 and we celebrated this amazing achievement with her party on May 28. Her first chemotherapy treatment was on June 6, 2018 at Kapiolani Hospital. It went well with little side affects. She went back to Maui that same day and went about her daily happy go lucky life by going to the beach or hanging out with friends and family. Her next scheduled treatment was on June 27. On June 19, 2018 while at work her Mom Darice received a call that afternoon that Peka was in extreme pain from her stomach. She called 911 and they were able to administer pain medicine immediately to give her some relief. Maui Memorial Medical center did a CT scan and it revealed that her intestines were heavily backed up and she could not move her bowels due to the tumor blockage. They tried a regimen of Miralax to get things moving but it just made her pain worse. During this whole process she was undergoing fertility treatments so her eggs could be harvested and saved for her future, but that proved unsuccessful. The plan was to try fertility again after the second or third round of chemotherapy. But while she was in so much pain she made the heart breaking decision to not save her eggs and to perform the needed surgery and remove her ovaries now. Her Doctor agreed and she was medevaced to Kapiolani Hospital on June 20. Her Surgery was conducted on June 21, 2018 as she was surrounded by family and friends. After a few hours her Doctor advised us that her cancer had spread and he was no longer able to remove the tumor and cancer from her abdomen without putting her life in danger, so he stopped. She is at Kapiolani Hospital now recovering from surgery and has had some challenges, so recovery is longer than expected. Plan B is to now give her a series of shots and pills to stop the estrogen production in her body which is feeding the cancer. This will stop it from spreading while also shrinking it. Once that is accomplished, she will go into surgery again to remove everything. At this point, insurance has not approved to cover the required shots for her treatment. Her family plans to proceed with or without their approval to ensure she receives the needed treatment to get her back to normal. Darice has been by her side while Daddy Louis has been home taking care of her two sisters, 'Ihilani and Kolokea. 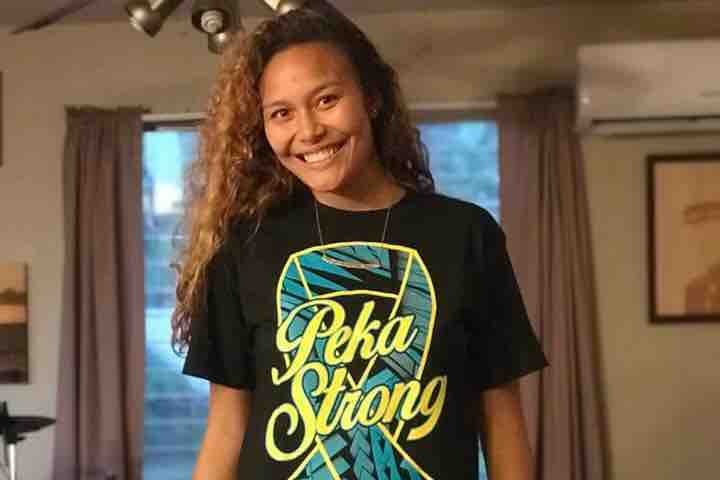 Peka has a huge support base from her family, friends and church family. Her faith in God is strong and we believe that God has his hands on her and she will be his walking testimony to share his miracle healing upon her. While prayers are what she needs the most, medical bills are starting to come in and as much as her family hates asking for help, there have been so many people reaching out wanting to help financially so they have decided to start this page to aslo keep everyone updated on her progress. We Love you all and thank every one of you for your love and prayers. Aloha Kalikimaka everyone! I pray everyone is healthy and prosperous and ready for a wonderful Christmas Holiday. We have finally done Pekas CT scan and just left Dr Carney’s office. Great news is that her hormone treatment is working! Her CA 125 count which is the cancer cells is down from 61 to 48 and there is overall shrinkage of the tumor and spots in her pelvic area. There are no new spots and no growth anywhere. Thank you Jesus!!!! She will continue on the same treatment path and just continue to gain weight and get stronger every day. She has gained 16 lbs since we’ve been home from Houston and she is no longer in daily pain. The pain comes and goes but nothing compared to what it used to be. Her next Ct scan will be in March and from now until then she will continue to prosper and live her life to the fullest. Thank you for all the continued prayers and we will continue to plead the blood of Jesus over her. Have a very Merry Christmas and a Happy New Year! We met with Dr. Gershensen at MD Anderson this morning to discuss Peka's treatment plan and future options. We can take comfort that the treatment Dr. Carney has been providing is the perfect treatment plan for her. Her tumor is responding to the 2 hormone inhibiting medications that she is currently on and the recommendation is that she remain on these for as long as the tumors are shrinking. If there is no change or if there is an increase in size at the next Ct scan in December then treatment will change to either a different hormone inhibitor or chemo. The doctor made recommendations for those to Dr. Carney. There is also recommendation to see a stomach doctor, a bladder doctor and a nutritionist to help with her current health. Hopefully this team can help with weight gain and comfort. The most important thing to take from this is that Peka is on the right treatment and there are multiple good options for the future. The short term goal is to continue tumor shrinkage, increase nutrition and manage pain. Aloha all, just a quick update that Pekas appointment is now scheduled for 10/8 at MD Anderson in Houston Texas. Next update will be from Houston! CT scan shows tumor shrank 5 cm. Was 12 now 7 but cancer spots are still there . Nothing is growing but nothing is shrinking it’s kind of stable right now. Dr is referring us to MD Anderson DR Gershenson. In Texas. We will leave as soon as he can get us in which will be soon. Thank you for all the continuous love, support and prayers. God Bless. Love you all.